What can I say? I love Taco Inn. Unless you live in Lincoln, NE or the area, you have no idea what I am talking about, but you have to trust me on this one. I live in Omaha, and make what we call "taco runs" every month or 2. It is an hour to get these enchiladas but who cares? My nieces who grew up in Lincoln, and I occasionally torture each other with photos if we are on a "taco run". Do you have a place like that? A place you love and so you occasionally indulge and when you do it is all fireworks and rainbows?! Once in awhile Geo will say, "Let's go somewhere for lunch we haven't been in a long time". When I have no response, just an empty stare he will sigh and say, "You want a taco run don't you"? THIS is why I love this man. Now this recipe is just crazy easy. I even considered not writing about it, but I decided my beloved Taco Inn deserved to be written about. I think I hit these dead on. Or as close as I can possibly get. I have made them before with no onion. You all know how I feel about onions. BUT. This can't be recreated properly without them. I know everyone of you are at different cooking levels, is a "to easy" recipe such a bad thing? I serve these with some rice and chips and call it good. I mean after all, at Taco Inn, they come alone, but we all know a side of Meat Nachos is a must. So amigos, let us move into the important part of this recipe. The MAKING. Oh and let me tell you, without sounding to "Steel Magnolia's" on you...these freeze beautifully. As I typed that, I said it with a southern accent in my head, just so ya know. I love having things I can pop out of the freezer on a night when my kitchen vibes are weak! Preheat oven to 375 degrees. Brown hamburger and onion together. Mix the taco seasoning packet into 1 cup of water, then pour over the browned hamburger. Heat your corn tortillas in the oven or in the microwave, you need them very warm (almost hot) to make them pliable enough. On a cookie sheet, lay down a shell, cover half of it in your hamburger mixture and fold in half. Repeat this until all of your hamburger is used. Arrange on a cookie sheet or in a baking pan. 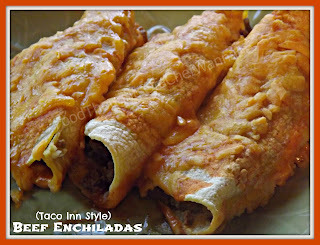 Cover with red enchilada sauce and cheese. Bake for 10-15 minutes. Remove and serve! I want to know how they make the soft shell tacos so light and tasty? But for serious, the meat nachos and bean burritos!! It pains me to live 60 miles away. Seriously! You gotta deconstruct the bean burritos... it pains me to live 50 minutes from my Taco Inn. Chris!!!! OMG these sound crazy good! I think I may even make them for dinner tonight. Thanks so much for linking up to Simple Supper Tuesday!